At an auction in Tewkesbury earlier this year an item in the catalogue was described as ‘Sundry Deeds’. It turned out to be a box of documents relating to No. 3 Barton Street. Having attended most of the local auctions, I was unhappy at missing this one and thereby missing the chance to bid for this lot. Fortunately, the item was spotted by a local man, Nick Warner, and he was able to purchase the lot; otherwise it might have gone out of town and not have been seen again. There is a detailed summary of the deeds transcribed by Wendy Snary. The documents included two wills, with the deeds dating from 1750 to 1920. The majority were on parchment, drawn up by solicitors, and carried the seals and signatures of the main participants and the witnesses. 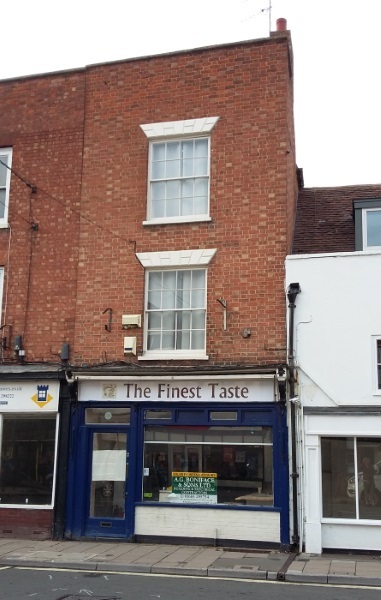 The property had been bought, sold, let and sublet to and from a wide variety of people, many of whose names were recognisable as Tewkesbury families. The earliest document was a deed dated 9m of April 1753 which involved several parties whose names will be familiar to most people; Kenelm Bubb, Cotton Merchant; Nathaniel Jeynes, Ma1tster; Thomas Pumfrey, Cooper, and others. Property is not identified by a number, but by naming those persons recently in occupation of the premises, and those on either side of 3, Barton Street. The sum to be paid for the property was "£40 of lawful money to be paid by William Woodward for the property to be in his possession, or his wifes, heirs and assigns, for a term of 500 years." Using John Dixon’s calculator for the comparative value of the pound, the value today would be £3056. £20 of this sum to be paid to William Mason, Victualler, from the rents received from the letting of the property. Although he was in business, William Woodward could not write and made his mark with a cross. On 29th of Sept. 1759 an assignment of mortgage was recorded as another quadripartite agreement between "William Mason, Vict. And Rev. Samuel Wooley of Powick, Wore. MA." and his five sisters, all spinsters, together with two other parties, including Sarah Woodward, widow of William Woodward deceased, Samuel Webb, Cutler and his wife Sarah, and John Hawkins, Haberdasher. Mr. Woodward had died between 1753 and 1759, with his widow deciding to sell the property, perhaps to realise her portion and gain an income from it. Dated 9th December, 1763, the next document recited all the details mentioned in the previous agreements, and transferred the property from the widow of Samuel Webb, deceased, to Mrs. Eleanor Bames, "in the sum of £40 of good and lawful money". This meant that the current value was now £2674. Only four years later, Eleanor Barnes was dead, and her new husband, Edward Quarington, was selling again. This time the purchasers were described as Trustees, Samuel Webb and Benjamin Lane, who paid £90, equivalent to £4979 at today’s prices. Also included in the document is a payment of £10 to Samuel Webb by Benj. Lane, described as "consideration money"! Today £10 would be worth £553. There was a stipulation that Mr. Webb must insure the property against fire with the Sun Fire Office in London to the value of £100 (£5533). A tripartite agreement followed in December 1773, quoting Samuel Webb, Benj. Lane and Jonathon Gilbert of Titley, Yeoman. Here the property was released in the sum of £40 (£2213). The building then appears to have been held in the same hands for the 26 years, until 1798, when Jonathon Gilbert was to receive the sum of £100 from Mr. John Mann, and a further £5 "consideration money" to Samuel Webb. J .Gilbert could not write and made his mark in the form of a crucifix. Mr. Mann was described as a fisherman. This is accompanied by two other deeds; the first shows that Thomas Whithom paid to Edward Morris, his wife Sarah and Thomas Waldron the sum of £105, the full consideration money for the property. 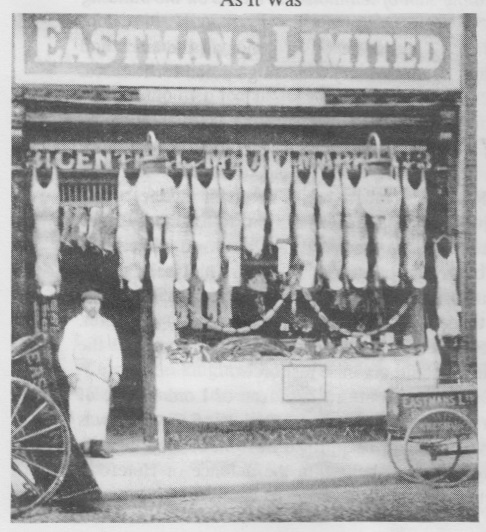 Edward Morris was a Worcester man and a leather dresser by trade, probably with a business in Tewkesbury. The document is dated 1798, some nine years later. It mentions the transfer of the building from Jonathon Gilbert to John Mann. However, John Mann had died, leaving his wife and Thomas Waldron as joint executors, who sold to Thomas Whithom. The second deed dated 1798 introduces a fourth party, Samuel Trueman, Gent. of Tewkesbury. In February 1800, Thomas Whithom disposed of the property to a Richard Screen, for £200 (£5630), reciting again the provisions of previous agreements, owners and tenants, John Bashill, John Cresswell and John Warner. On the same day Richard Screen agreed to rent the buildings for one year for five shillings (£7). A mortgage deed of September 1828 allowed William Causon to secure a banking account with Hartlands Bank and £200 capital in return for his part of the property left by his father on the death of his mother, Martha Causon. A further sum of money would be due to George Watson, Bleacher, totalling £1,000 (£37,300), which had been borrowed by the Causon family. These were considerable sums of money at that time. Further investigation reveals that William Causon the younger mortgaged his future inheritance to operate the Quart Pot Inn, which was also in the family. The Inn was situated next to "the newly erected Market House", where the Methodist Church now stands. 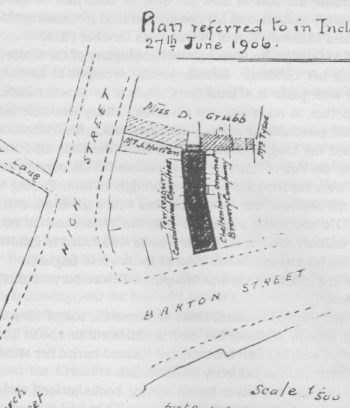 There was land and buildings in the possession of Martha Causon on Fletchers Alley on Barton Street, too. A seriously wealthy woman must have been Martha Causon! 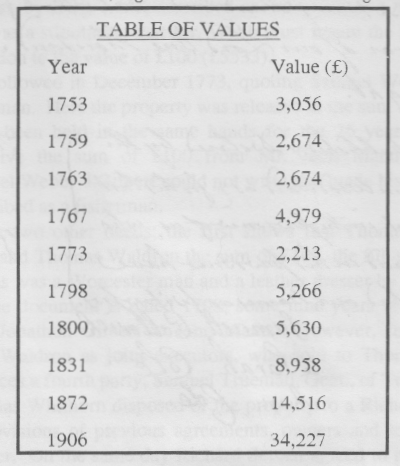 The next date is 23rd of June 1831, which verifies the death of William Causon and the transfer of £76.ls.0d. (£2,843) to Hartlands Bank, obviously the remainder of the debt, and the sum of £163.18s.4d. (£6,115) to G.Watson. No. 3 Barton Street was now in the hands of William Potter, a shopkeeper. In 1872 the property is in the possession of Philip Knight, described as Supervisor of Excise living at that time in Campbelltown, Argyllshire, and is then sold to William Winterbottom of Tewkesbury for £380 (£14,516). There were trustees involved in the sale under the will of Philip Knight, who required the property to be sold by auction, but gave the trustees some discretion to obtain the best value. There may have been some dispute about the sale, as the trustees assigned an addition to the deed, declaring that "in order to avoid the expense of an auction, the trustees obtained an evaluation by Messrs. Moore and Weaver of Tewkesbury, in the value of £380" (£14,516). The problem my have been caused by the fact that the solicitor who drew up the document was the William Winterbottom who bought the property. After this there is a gap until 1906, when an agreement was made, reciting all the previous deeds at length. For the sum of £640 (£4,227), Mr. George Potter Howell, Builder, of 22, Barton Street, paid to John Wiltshire of Lwres, Joseph Henry Knight, Bootmaker, formerly of Tewkesbury. 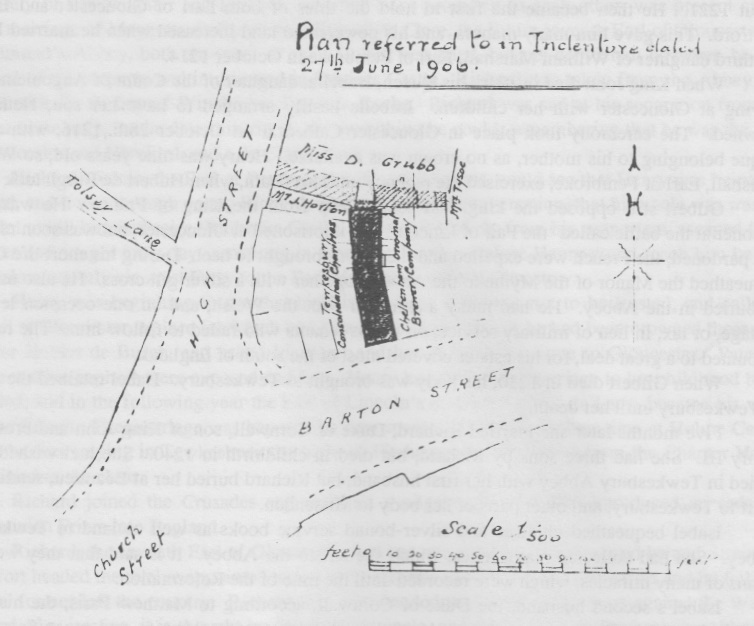 A plan is attached to the deed showing the site in red with the Tracy Arms on the south side. belonging to the Cheltenham Original Brewery Co., and on the west property owned by Tewkesbury Consolidated Charities. Mr. Howell was a shareholder in the Tewkesbury and District Permanent Benefit Building Society, and owned eighteen shares to the value of £540 (£28,879). He then took out a further mortgage with the Society for the remaining thirteen shares. In 1920 a search was done on the property by H.W.Brown, Solicitors, who reported that No. 3 Barton Street was subject to an ancient QUIT or SOC rent, amounting to two shillings and Sixpence per annum. This is not mentioned in any other document, nor is there any indication to whom the payment should be made. The early documents used archaic language, and many of them repeated the details shown on earlier documents. The property is described at great length, but not by a number, and such phrases as "all outhouses, buildings, shops. cellers, sollars, lights, pavements, outlets, courts, yards. barksides, ways, watercourses, commons, commons of pasture. easements. profits, priveledges. advantages, and appurtenances whatsoever. together with the said messuage or tenement"!